Stelarc experiments with alternative anatomical architectures. He has performed with a Third Hand, a Stomach Sculpture and with Exoskeleton, a 6-legged walking robot. Fractal Flesh, Ping Body and Parasite are internet performances that explore remote and involuntary choreography. He is surgically constructing and stem-cell growing an ear on his arm that will be electronically augmented and internet enabled. Recent performances include ReWired / ReMixed that incorporates an outsourcing of his senses and a sharing of his agency. In 1996 he was made an Honorary Professor of Art and Robotics, Carnegie Mellon University and in 2002 was awarded an Honorary Doctorate of Laws by Monash University. In 2010 he was awarded the Ars Electronica Hybrid Arts Prize. In 2015 he received the Australia Council’s Emerging and Experimental Arts Award. In 2016 he was awarded an Honorary Doctorate from the Ionian University, Corfu. His artwork is represented by Scott Livesey Galleries, Melbourne. 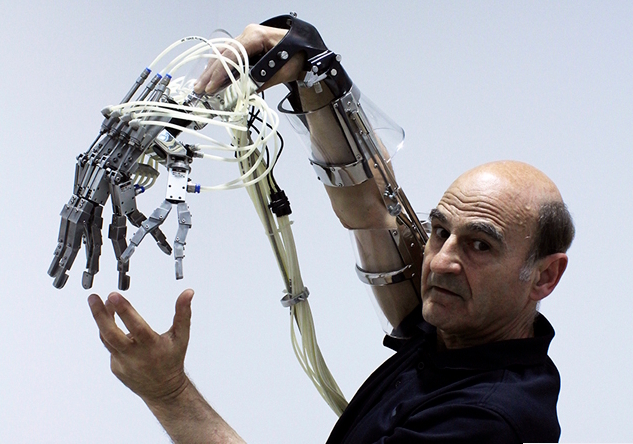 For Mecha, Stelarc will be presenting video documentation of recent performances and attending the festival in person.